Evetech is pleased to announce the very first range of the 8th Generation Coffee Lake Intel Core i5 Processors! These CPUs are unlike any other Core i5 previously released – featuring a tantalizing 6 physical cores. 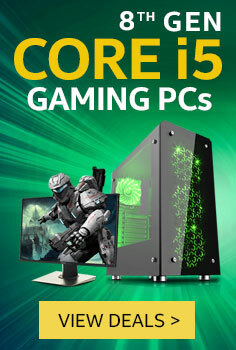 Our wide range of products include Intel Core i5 Gaming PCs, Workstations, Upgrade Kits, and even standalone processors. Intel’s reliability and performance in the CPU market aren’t exactly a secret. A significant multi-core performance boost (upto 60%)compared to the last generation of core i5 processors ensures that any PC built around this processor will leave the competition biting the dust. Whether you’re a gamer or a content creator limited by budget, the 8th Generation Intel Core i5 offers a rare amalgam of reliability, affordability, and premium performance! 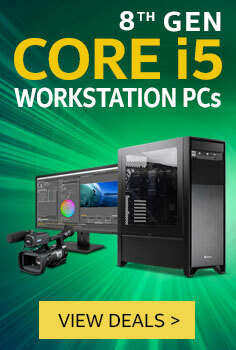 In fact, these Core i5 processors run at a performance comparable to last generation’s Core i7! Top-tier performance at a budget price has arrived on the scene. Experience the true power of an 8th Generation Intel Core i5 processor. Transform your reality. For good. Choose your path, and enter the world of premium computing. Today! Boasting the best hardware in the market, our lineup of gorgeous gaming rigs is sure to catch your eye! These PCs offer the easiest path to upgrading to the latest generation Intel processor experience. The 6 physical cores make the gaming experience even smoother, as the CPU now has more than enough headroom to handle background tasks. Looking for a work PC? No problem. Evetech’s 8th Generation Intel Core i5 Workstations will give you the performance boost you need, without breaking your bank! 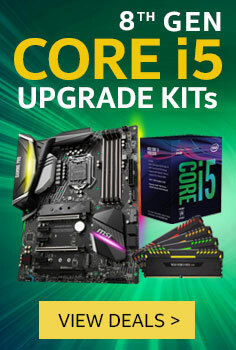 On the other hand, our upgrade kits allow you to refresh your PC with absolutely no trouble. Evetech 8th Generation Core i5 Upgrade Kitsare created with compatible and quality hardware components – so, all you have to do is plug em in! Affordable premium performance has been a myth for a while. Even though companies have tried to offer reasonably powerful processors at lower price points, they have come bundled with a host of compromises. No more! Intel pushes the envelope with its latest 8th Gen Intel Core i5 CPU lineup! Enjoy a truly premium computing experience with the latest Intel Core i5 processors – offering a substantial performance bump over the last generation processors. However, if you’re still on the fence – here are the top 5 reasons you might want to buy one today! More Cores, More Performance. Like all other processors in the 8th Gen Intel Core processors, these Core i5 processors also feature two additional cores compared to last generation. With a total of 6 physical cores, this is no longer in the ‘budget’ CPU realm. In fact, it is now a full-fledged competitive CPU can hold its own against much costlier offerings as well. Price to performance ratio. This is an important statistic for those who look for value purchases. While priced similarly to last generation Core i5 processors, the 8th Gen Core i5 offers a massive improvement in multi-core tasks, while also bringing a healthy single-core improvement! This processor will disrupt the mid-range segment of CPUs – because finally, a fair price meets raw compute power. Z370 Motherboard. Adopting the newest Intel chipset will allow a host of improvements in your rig, especially if you’re running hardware that is more than 3 years old. More PCIe lanes ensure that your peripherals never feel left out. Performance that exceeds previous generation Core i7! Yes, the 8th Gen Core i5’s performance improvement is so substantial that it outpaces last generation Intel Core i7 processors easily. Moreover, this processor also crushes competitor CPUs with much higher core and thread counts as well. Improved Power Delivery for better temps across the board. Intel’s refinement processes have allowed them to improve power delivery, resulting in lower temperatures. Hence, the locked CPUs will run cooler, while the unlocked CPUs will boast a much higher overclock potential. The 8th Gen Intel Core i5 processors are a game changer. They will disrupt the mid-range/budget market segment and you need to be a part of this revolution! 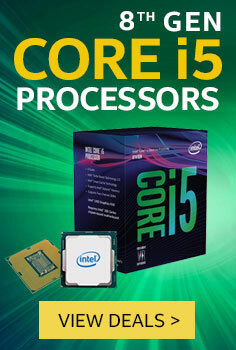 Grab the Intel Core i5 CPU of your choice from Evetech today.